Flash Memory Summit At the Flash Memory Summit this week in Santa Clara, California, Toshiba claimed it's possible to get NVMe-over-Fabrics access speed on bog-standard Ethernet, Attala flashed its shared flash cache, the crowd oo'd and ah'd at PCI gen 4.0, and the industry meditated on enhanced 3D NAND layer counts and disk drive cannibalisation. Toshiba told the conference its Kumoscale software, which delivers an aggregated multi-SSD block storage pool across an NVMe-oF connection, works with the NVMe over TCP protocol. Tosh has tested this using Marvell FastLinQ 100GbitE network interface cards (NICs), which employ a TCPOffload engine. It said NVMe-oF on TCP enables a good price/performance balance because standard Ethernet components can be used instead of the data centre class required by RoCE-based NVMe-oF, for example. Tosh roped in IDC's research VP Eric Burgener to say something nice about it: "Solutions like Toshiba's KumoScale, which uses TCP as a transport, give customers an NVMe over Fabric option that requires no custom hardware or software on the server side, making this higher performance host connection available to any and all servers without additional cost." So there is, Tosh implied, no need to go down the RoCE road. It said the NVMe organisation is actively working on a binding specification for NVMe-oF over TCP, and it is ready for the upcoming certification process. A canned quote from Mavell's Rajneesh Gaur, SVP and GM for the Server Connectivity Business Unit, couldn't resist trying to cover all the NVMe-oF bases: "Marvell FastLinQ 10/25/50/100GbE NICs [are] currently the industry's only solution with concurrent NVMe-oF offload for TCP, RoCE and iWARP, and provides compelling flexibility, scale and performance while reducing time-to-market and time-to-revenue for our joint customers." Attala would like you to stick your data lake in its tailored hot cache box. The startup produces FGPA-driven SSDs for direct NVMe-oF access to targeted drives and a composable NVMe storage resource, and has announced Attala Data Lake (ADL) multi-tenant software. The concept is to have a data lake, a massive pool of data, stored on NVMe flash for faster access by multiple real-time applications, a shared flash cache as it were. This time Deep Storage founder and chief scientist Howard Marks ladled out the blandishments: "Users can, and have, installed NVMe SSDs directly into their compute nodes, but that increases costs and complexity. Attala Systems' new multi-tenant hot data lake capability provides shared high-performance NVMe storage to real-time analytics applications, simplifying deployment and reducing costs." The ADL software module provides centralised management and provisioning of the hot data lake. Attala said: "The result is a low-cost, high-performance solution for real-time analytic applications." Well, yes, but not exactly low cost; SSDs in sufficient capacity have to be bought and that won't be cheap, unless we are talking about data puddles rather than lakes. The ADL module is available for evaluation by select customers and partners, and will be generally available in the fourth 2018 quarter. Composable infrastructure outfit Liqid has announced a PCIe gen 4 x16 Element NVMe SSD. It features speeds up to ~25GB/sec and up to ~3.5m IOPS (4KB). There can be up to 8 x M.2 modules per card, with a 32TB maximum capacity. The SSD has power loss protection and a multi-port capability for multi-host access. The Liqid Command Center management software can dynamically compose and orchestrate bare-metal storage elements from the storage pool to individual servers. CEO Sumit Puri spoke of PCIe gen 4 "transforming milliseconds into microseconds". Broadcom's PEX88000 PCIe 4 switches are mentioned in Liqid's release. Other partners are Phison, One Stop System, Toshiba, and Hagiwara Solutions. Microsemi announced its SXP 24G family of devices, with multiple device variants ranging from 28 ports to 100 ports per device. The range includes a 24G SAS expander, with a SAS-4 physical layer, using PCIe 4.0 connectivity. The firm said gen 4.0 provides a balanced speed increase needed as SAS-4 interfaces proliferate. The 4.0 specification effectively doubles gen 3.0 speeds. The spec is available from the PCI SIG – registration required – but you can also get a sense of it from a freely available Intel doc. SAS-3 runs at 12Gbit/s and SAS-4 doubles that speed. Microsemi said bandwidth has gone up from 1.2GB/sec per lane to 2.4GB/sec. 24G SAS is backwards compatible with SAS-3 (12Gbit/s), SAS-2 (6Gbit/s) and SATA (6Gbit/s). Interestingly, SAS-4 is not described as running at 24Gbit/s. A Pure Storage contact told us that older SAS generations used 8b/10b encoding. SAS-4 uses 128b/150b at 24G speeds, so the real signalling rate is 24 * 150 / 160 = 22.5Gbit/s on the wire, even though effective data throughput doubles from 12G. 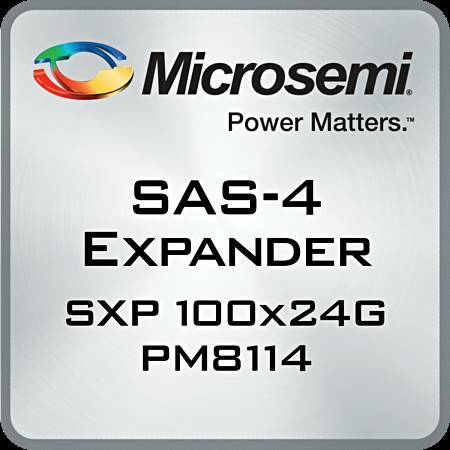 SXP 24G SAS expanders will sample to select customers in 2018. A presentation by NAND Flash industry pundit Jim Handy (Objective Analysis) outlined a view that the NAND flash industry is on the cusp of a severe (60+ per cent) price correction – trending from current ~$0.25/GB to $0.08/GB at some point in 2019 (or to the level of 64-Layer 3D NAND production costs). Micron has positioned its QLC-based 5210 ION SSDs as a replacement for 10K RPM mission-critical HDDs, as well as 4TB/8TB nearline/high-cap enterprise HDDs. The NVMe over Fabric (NVMe-oF) 1.4 standard will enable support for enhanced QoS and multi-pathing via Microsoft, Linux, etc. NAND flash accounts for 50+ per cent of Western Digital revenues. Deep Storage's chief scientist Howard Marks believes a 5x differentiation in $/GB between enterprise SSDs and HDDs should be considered the crossover point to move toward SSD cannibalisation. Rakers believes enterprise SSDs are currently at a ~3-4x $/GB premium relative to mission-critical HDDs, and enterprise SSDs currently stand at ~15-17x $/GB premium relative to nearline/high-cap enterprise HDDs. SK Hynix is focused on leveraging its use of Charge Trap (CFT) with Peripheral under NAND Cell (PuC) for next-generation 3D NAND branded as 4D NAND – a technology the company believes it can scale to 500+ layers. SK Hynix will use the 4D NAND architecture to move to 1xx, 2xx, and eventually 5xx-layer NAND. SK Hynix has a 96-Layer QLC product with 1Tb density in a mono die – the company believes QLC will drive the replacement of nearline HDDs; sampling in 2H2019. Toshiba Gen 4 QLC will start production volumes in early 2019 – driving support for 20TB M.2 SSDs and 85TB U.2 SSDs. Toshiba's XL-Flash will be new low-latency 96L 3D NAND; positioned for random IOPs with better QoS at shallow queue depths.